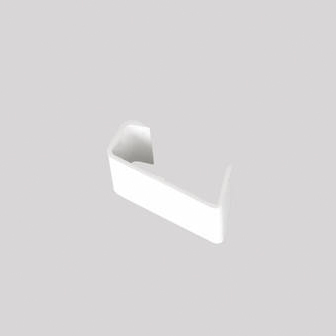 Available in either black or white, Corovent CDV Continuous Dry Verge Straight Connectors are used for the connection of two Dry Verge lengths. S Profile Straight Connectors are only compatible with Continuous Dry Verge S Profiles. The roof battens are fixed in place to the required slate gauge, however, the batten ends are not fixed in place as yet, to allow the 60mm flange of the slate verge to be fitted under the batten, which is the easiest way to fit in place. The roof battens ends are then securely fixed in place, by nailing through both batten and verge, into the timber rafter. The slate verge profile is then at an angle, which is manufactured in that way, so the top flange clamps down on any thickness of slate, from a 5/6mm general slate to 12/13mm natural slate. To open the external face of the slate verge, a temporary batten is placed between the batten courses, which is pushed against the inner face of the slate verge, and nailed in place. This opens the profile of the verge to a vertical position. The slate are fixed in place in the usual manner, with the outer edge of the slate fixed against the internal edge of the verge. This will hold the verge in the vertical position, and continue this procedure in the normal manner up the verge of the roof. The Continuous Slate Dry Verge achieves a professional finish. This will be similar for any slate being used. The completed roof gives complete continuous cover against water penetration, and added strength from wind damage by securing end slates firmly.